Most people would balk at the idea of living in a home that’s only 300 square feet (or less!). But for me, and a growing number of other people, it would be a dream come true. With the uncertain economy and tanking housing industry, more and more people are joining the “mini house” movement. These homes are the backlash against the McMansion movement of today. They’re simple, environmentally friendly, and incredibly inexpensive to live in. The picture shown is a home owned by Gregory Paul Johnson, who helped pioneer the small house movement. He runs The Small House Society, and his home has been featured in The New York Times, Time Magazine, CNN, NPR, and the Wall Street Journal. His mobile hermitage is 150 square feet total, and was built by Jay Shafer, of Tumbleweed Tiny Homes. Why Live In A Mini House? I’ll say it upfront: these micro homes, especially the super-small ones, are not for everyone. For instance, families with children would have a trying time of things. But the good news is that micro homes come in a wide variety of sizes. The smallest start at 60 or 80 square feet, while the larger pre-fab micro homes start at 300 square feet and go up to 900 or more. So, why would you want to sell 95% of your possessions and move into a home the size of many people’s closets? 1. Simple Living– Most people have a house full of possessions. But many times, the possessions you own end up owning you. Living with only the bare necessities frees up your time (and income) to do things you really want to do. Instead of spending hours cleaning your house, you spend minutes. Instead of shopping and spending money, you visit with friends. 2. Green Living– Most of the builders and designers that are part of the micro home movement live green in their own lives. Thus, most of their homes are green as well. Living in a micro home means that you’re using dramatically fewer resources. You can’t buy “stuff” because you have a limited amount of space. Micro homes consume far less energy than traditional homes, and most of the time they’re designed and built using renewable resources, like cork and bamboo. Many of them also utilize green practices like wind and solar energy, and greywater recycling. 3. 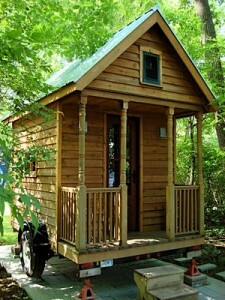 Frugal Living– As you can probably imagine, micro homes cost far less to live in than a 2,500 square footer. How much do they cost? Well, the price range is fairly wide. 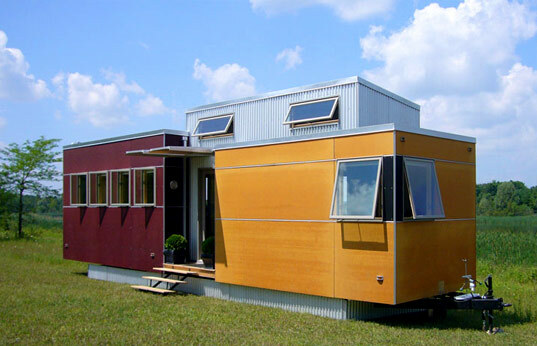 The micro home that Gregory Paul Johnson lives in is portable and costs around $15,000. But, it has no bathroom. Larger homes, like those designed and built by Jay Schafer, of Tumbleweed Tiny Homes, start at $36,000 and go up from there. Some, like the larger, ultra-modern designs, will cost $100,000 or more. I’m sure you can also guess that living in a mini home means that your utility bills are mini as well. Like I said above, many designers and builders in mini homes also incorporate wind or solar into the home, which means that in many cases, you can live completely off the grid in one of these homes. One company, Mini Homes, says that the average utility bills for their homes are $300. That’s per year, mind you. There are as many different micro home designs as there are designers! Some look like traditional houses, others are arts and crafts style, some look like old-timey Texas saloons, and other pre-fab homes are part of the modernist movement. Personally, I’m in love with the super-modern design of some of these mini homes. Imagining living in a space like this really gets my heart pumping with excitement! Tumbleweed Tiny Houses– Tumbleweed’s tiny homes follow a more traditional home design, although there is one model that has a very modern look. BlueSky MOD– BlueSky MOD homes have a modernist design. WeeHouse– WeeHouse is another modern micro home. Bear Creek Carpentry– Bear Creek is a design/build firm in the Adirondacks, and their homes stick with a more “cabin” look. Mini Home– Mini Home’s designs are very contemporary. For my part, I think these are my favorite micro homes. I love their designs! Tiny Texas Houses– All of Tiny Texas Homes’ mini homes use reclaimed wood and other materials, and they look like they’ve been out in the elements for years. Loft Cube– These cubes have been designed for rooftop living (like in New York), but as far as I understand it, I think you can put them anywhere. V2 World Homes- Another modernist designed mini home. Sidekick Homes– These little homes, designed by Kephart Living, LLC are sort of a modern take on the traditional “backyard cottage”. M Finity– M Finity has some very small homes that are modern, but not extremely so. The cool thing about M Finity is that they offer free shipping and free set up on their mod homes. “Want To Live In A Shipping Crate?”– Posted here at The Greenest Dollar. This Tiny House– A wonderful blog on small home living, and how to prepare for living in a micro home. Don’t miss it. Mark Terrano’s Blog– Mark Terrano built a gorgeous mini home for his mother in Washington state. His blog details the project every step of the way, and has some really amazing pictures of how his home turned out. Inhabitat– Inhabitat’s site has a lot of great articles on living small and living green. The Small House Society– There is a lot of great information here on living in a mini home, and all the advantages (and disadvantages) that go with it. Small House Style– This is a wonderful site chock full of information on living in a small house. They also have a great list of designers, builders, and pre-fab micro house kits. Small Space Living– This blog is dedicated to living in a small space, and how to make your possessions do double duty. I can’t say enough about this blog; please, just search through the archives and look at some of the gorgeous, space-saving furniture. It’s art in every sense of the word. Tiny House Design– This blog is chock full of awesome information on tiny home living. It has house plans, tips, personal stories, and an impressive amount of resource links for online communities focused on tiny homes and simple living. Don’t miss it! Since discovering the small home movement, however, we know this is the direction we’re going to go. Currently our home is 1300 square feet, and we don’t use a good portion of that space. I know we could live in a micro home. We could definitely do 500 square feet, and perhaps even less than that. Again, I know that living in a mini home isn’t for everyone. But let me say this: before my freelancing business got going, I owned a professional organizing business here in Michigan. And I can’t tell you how many times I heard clients say “Sometimes I wish I could burn down the house, with everything in it, and start over”, or, “If my family wasn’t attached to this place, I wish I could just walk away from all of this stuff”. Our consumerist society has trapped a lot of people into living with “stuff” they don’t need, or want, any longer. And because they spent money on all this stuff, they have a hard time getting rid of it. Can you imagine getting rid of it all, keeping only the things that you care most about, and living in a space that uplifts you instead of dragging you down? I can, and it’s incredibly exciting to think about. In this case, less truly is more. Coming Unmoored » Why Live in a MicroHome? Wow, I wish I had found this article before I wrote about Living it Down Small. I’m going to have to write a follow up and link here. I just LOVE these houses. My current one bedroom place is about the right size (maybe a little bigger would be nice) so in the morning I’ll have to measure it all up. In some weird way, I really fancy one of those containers but I suspect I’d go for something with a nice homely wood feel so long as I can actually get my hand on such a thing here in New Zealand. I love these little houses. The older I get the more interested in them I am. I love my house but I am really yearning for a smaller one. Thanks for the resources! May your dream of 90 acres in the Ozarks come true! Since I’ve discovered the wonderful world of mini-homes, I’ve actually started living as if I was about to get my own. I’m trimmed down my “stuff” dramatically (giving away and recycling), and I’ve discovered the more I get rid of, the better I feel. It’s wonderful! Even small houses need a place to stay, or to visit. As I strive to learn more about the benefits of tiny living, while going back to school for my accounting degree. Tiny homes remind me of camping, and I love camping. I would love to meet like minded people that are interested in low impact ECO friendly building, as I am in the process of planning the future of a formerly permitted small manufactured home park & campground, with an awesome back yard here in the Southeastern corner of the Adirondacks, with a private boat launch on Southern Lake Champlain west of Maple Bend Island, between Buoys 18 & 22. I would love to meet some others that are interested in tiny homes that are in my area, or would love to work/play in my area as I repair, and renovate in an ECO friendly manner. I haven’t seen a tiny home on a pontoon boat, but then again maybe I have when I think I’m looking at an ice shanty. I was wondering if any readers out there know how to contact the designer of the MINI HOME as feachered on YOU TUBE his name is Andy and he lives in Canada i think…. an architect intern….. so says the walk thru video on YOU TUBE. love this whole idea of living small and frugal…… hoping that the MINI HOME pictured above could be purchased in DIY kit form…. shipped here to AUSTRALIA so if anyone can advise please drop me a line. In all honesty this isn’t any different than the hundreds of people in marina’s all over the country living on boats, most often sailboats. A bed, a head, a table and galley are pretty much what one needs. Flat screen TV’s and digital radio, solar and wind power make it pretty simple. Water and waste are the hard issue. For land based applications security would likely also be more complex than in a marina. But small living is nothing particularly new. Just now sure why this is superior to a single wide travel trailer or camper van? To the post above me, I believe small houses are perceived as superior to a camper van or mobile home because of the design and style. A lot of the small or tiny homes I’ve been seeing online stress the importance of organization, in a fun stylish way. I can only dream of living in a tiny home! I’m completely down with this and ready to move to a shipping container house or other small micro home. The huge issue though is WHERE can you really do this legally? Few address this. Either the municipality dictates houses have to be over 1000 sq feet or building permits are close to $10,000 for a small $40,000 shipping container house (CA). WHERE in the USA can people do this without so many regulations that it makes it not feasible? Excellent article, I think the “less is more” approach to living in micro homes would really put things into perspective when deciding what is important.